Zacharias Dear was born premature in Creston, BC, and promptly transported with his mom, Lisa, to KGH for care. After two days, Lisa was discharged, but Zach remained under care for an additional five weeks. With nowhere to stay, Lisa and her husband, Max, were left scrambling. JoeAnna’s House will change everything for families like the Dears. “My son, Zacharias was born on March 19th, 2016 at 4:40am. 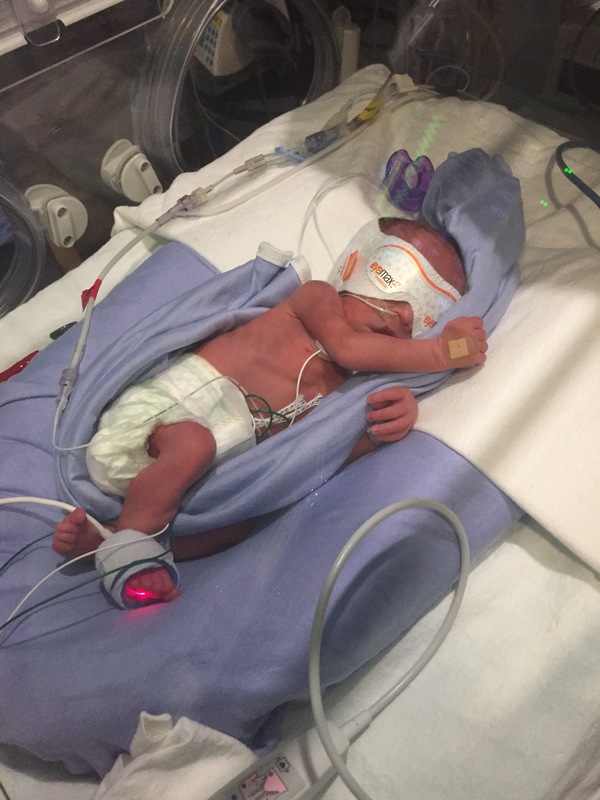 Premature and weighing just 2lbs 14oz, Zac spent his first 35 days in the NICU at the KGH. Our home, Creston BC, is 425km from the KGH – which is about a 5 hour drive on a good day, passing 4 summits to get there. I had a healthy pregnancy up until 33 weeks when I was diagnosed with pre-eclampsia. My midwife was out of town for the weekend and asked me to go to the hospital in Nelson to be monitored for a couple days. Nelson, BC is 73km from Creston which is about an hour and a half drive, passing one of the highest summits in Canada. On arrival, my kidneys were spilling proteins, my liver was failing and my blood pressure was extremely high (161/90). I was told to pack my bags for 2 days. I asked if I should be prepared to bring home a baby, and my midwife hadn’t even considered that. I literally had 2 pairs of clean underwear. At 1:00am, my doctor came into my room. He’d done a test around 9pm. At that point, he had no concerns and said he would do another test in the morning and then we’d be free to enjoy the rest of my pregnancy. My husband, Max, was thrilled to learn that we’d be home in time to watch his favourite team play soccer, or “football” as they call it in the UK. At 1:00am, my doctor showed up in my room and said he couldn’t sleep. He said something didn’t feel right and he didn’t want to wait to do the test. Within an hour, I was being prepped for an emergency C section. My husband asked if I could be induced – this wasn’t part of the “birthing plan” at all – and the doctor said any delays could be fatal. Not just for Zacharias, but for me too. I can’t even imagine what my husband went through in learning the circumstances were as severe as they were. He was my rock throughout EVERYTHING. Zacharias was born at 4:40am. I did not get to meet him until 9am. When he was born, he didn’t cry. The silence was frightening. When arranging for transport, the Vancouver Children’s Hospital was mentioned, and it wasn’t until the last minute that we found out we’d be medevac’d to KGH. Just a few hours after Zacharias was born, he was flown to KGH. I was unable to fly with him because I had just come out of major surgery and there wasn’t enough room for 2 patients in the air plane. It was absolutely heart breaking to watch my husband and my newborn son leave without me. I was unsure whether or not I’d even be able to fly out the same day to be with them. Luckily they came back for me 5 hours later. I arrived in Kelowna that afternoon. I was fortunate enough to be admitted into a room near the NICU while I recovered from my C section, however, I was discharged after just 2 days. Zac needed to stay for another 33 days and I found myself away from home, not knowing where I was going to stay, with my new born son in critical care. AND I only had 1 clean pair of underwear by now. It was so scary, I didn’t know what we were going to do. Fortunately KGH has some amazing social workers and Laura was able to connect us with the Variety Club and Cops for Kids – we can’t thank you enough!! These 2 charities were able to cover our accommodations and a few groceries for the duration of Zac’s stay in the NICU. Although everyone did the best they could, the hotel was a 10 minute drive from the hospital. I was unable to drive for the first bit while I recovered from my c section, and Max was only able to spend the first week with us. He had to return to work and was only able to stay with us on the weekends. Because we were unsure how long I’d have to stay, I had to change rooms every single week. Having JoeAnna’s House would have meant the world to me and my family. If we had the constant stability of knowing we had a safe place to stay for the duration of Zac’s time in hospital would have given me and my family so much security in that time of crisis. Having a welcoming place where other families going through similar experiences can connect and support each other – even just knowing that you’re not the only one – will make a huge difference. The KGH Foundation has committed to raising $8 million to building JoeAnna’s House, a home away from home that will keep families together when they need it the most. A home that will provide a place to rest and relax within steps of the loved ones’ bedside. A place to be in community with others who are navigating a similar, difficult path. Miller Family Mary & Dean Miller give because their son was saved.